You need a roof replacement (or maybe you’re building a new one?) and you don’t know enough about the different roofing types to make an informed decision. Two of the most widespread types of shingles available to residential homeowners are asphalt and laminate. You need to know what the differences between them will mean for your roof. Regular asphalt shingles are also known as “3-tab” shingles. They are flat, with only one shingle tab shape and size. Laminate shingles are also known as “laminated architectural” or just “architectural” shingles. They are a type of asphalt shingle, but are built with a heavier base mat and multiple material layers of a more refined type of asphalt. 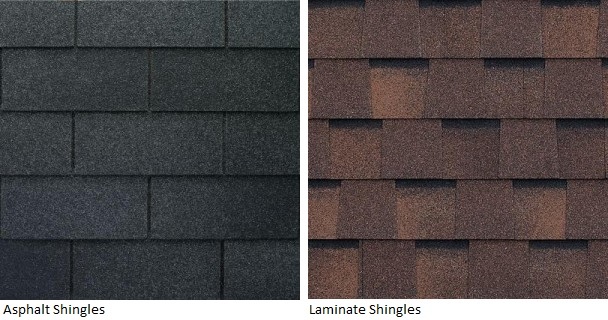 The shingle tabs have different shapes and sizes, giving them a more dimensional appearance. Click here to see our gallery of laminate shingles. Does your home’s roof need a replacement or upgrade? Contact us today for a free, no-obligation, and in-home estimate! 3-tab shingles are typically 50% lighter than their laminate counterparts; they are comprised of less material. Although the materials themselves are cheaper, they are more time consuming to install than laminate. Due to this, many roofing companies will charge the same for both options. Because laminated architectural shingles are heavier than 3-tab shingles and have the strength of multiple shingles, they can withstand stronger winds and more intense weather conditions. 3-tabs are much more vulnerable to wind, and can sometimes even be ripped away during stormy conditions. Laminated shingles typically last and retain their appearance longer than 3-tab shingles – extending the life of your roof significantly (up to as much as 20 years!). It’s important to know that warranties will always vary depending on the brand. However, 3-tab shingles typically have a warranty of around 20 to 30 years. You should also know that manufacturers massively prorate the warranty for these shingles, leaving you with next to nothing if they don’t last. Due to their greater reliability, laminated shingles have warranties ranging from 30 to 50 years – or even a Lifetime Manufacturer’s Warranty in many cases! Now that you know more about the differences between the durability and warranty, it’s time to talk about long term costs. Since laminate shingles are going to last you longer, you will actually save money in the long run! There’s an upfront investment for a long term benefit. Instead of needing a roof replacement after a few decades with 3-tabs, you can keep your roof much longer with properly maintained architectural laminate shingles. This will save you money over time. When seen side-by-side, it’s easy to tell that the ‘dimensional’ look of laminated architectural shingles is more aesthetically pleasing. Laminated shingles can also be styled to imitate slate or cedar roofing, which improves the appearance of your home for much less than it would cost to install these more expensive roofing types. Since laminated architectural shingles are more durable and nicer to look at than 3-tab shingles, you can probably guess that they will be the type of shingle to give you the better resale value on your home. Beyond that, as more homeowners are replacing their 3-tab shingles with architectural shingles, a home with 3-tab may look outdated in comparison. What’s the Best Option for My Roof? We recommend laminated shingles in nearly every case! When we lay out exactly why laminate shingles are superior, it’s not hard for our clients to see the benefits. Of course, you will need to consult with a roofing contractor about your specific home and roof before making a final decision, but in 99 times out of 100, we find that laminate roofing is the option that makes the most sense for homeowners. We are experienced roofing contractors with over 50 years in the business! Get a 10 year workmanship warranty on your roof replacement. Contact us today. Serving homeowners in Hamilton, Burlington, Oakville, St. Catharines, and Niagara. What Are the Pros and Cons of 3-Tab Asphalt Shingle Roofing?